The new compact dosing system (MoDoS) from Michael Smith Engineers. 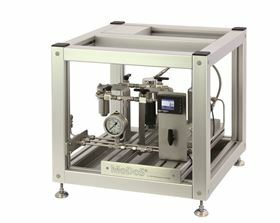 UK fluids handling specialists, Michael Smith Engineers, has released a modular dosing system (MoDoS) which provides accurate and continuous delivery of fluids in the laboratory, pilot-plant or continuous production processes. Each MoDoS modular pump system is fully equipped and ready-to-use and incorporates an HNP Mikrosysteme internal gear pump, filters, sensors, valves, fluid connections and controllers, all housed within a compact and sturdy aluminium frame. The integral micro-annular gear pumps from HNP Mikrosysteme are chemically inert and designed to handle aggressive and corrosive fluids. The hermetically-sealed pumps with a magnetic drive can be incorporated into the MoDos dosing unit, avoiding failure of rotating seals. This avoids cross contamination of pumped fluids, wastage and environmental hazards due to leaks. The systems, which are ideal for fine chemical or pharmaceutical applications, can be specified for capacities ranging from 0.003 up to 1152 ml/min, differential pressures up to 80 bar and on liquids with viscosities from 0.3 to 1000 mPa. Michael Smith Engineers has added the HNP 11558 micro annular gear pump to the range of HNP MZR internal gear pumps.